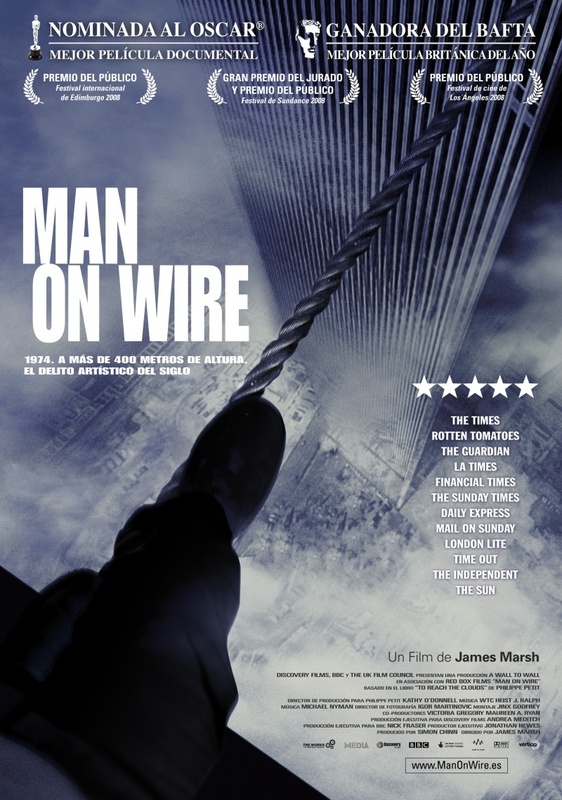 Man on Wire is a 2008 British-American biographical documentary film directed by James Marsh. The film chronicles Philippe Petit's 1974 high-wire walk between the Twin Towers of New York's World Trade Center. It is based on Petit's book, To Reach the Clouds, released in paperback with the title Man on Wire. The title of the film is taken from the police report that led to the arrest (and later release) of Petit, whose performance had lasted for almost one hour. The film is crafted like a heist film, presenting rare footage of the preparations for the event and still photographs of the walk, alongside re-enactments (with Paul McGill as the young Petit) and present-day interviews with the participants, including Barry Greenhouse, an insurance executive who served as the inside man. Man on Wire competed in the World Cinema Documentary Competition at the 2008 Sundance Film Festival, where it won the Grand Jury Prize: World Cinema Documentary and the World Cinema Audience Award: Documentary. In February 2009, the film won the BAFTA for Outstanding British Film, the Independent Spirit Awards, and the Academy Award for Best Documentary Feature.